The technologies generally associated with Makers, like 3D printing, are not just for making gadgets and small design objects: trend spotters should keep an eye on where 3D printing meets fashion, as the results from Paris Fashion Week roll in and are truly interesting. When "cold" technology meets a "warm" creative field, one normally expects that the machine element is used simply to make existing techniques faster or less tedious. But the most interesting results come from when technology inspires lateral thinking that results in the creation of something new, in which techology is an intrinsical creative element and not just a way to do the same things better than before. Can the same be said for how "Makers" technologies are applied to a creative field like fashion? We think so. Some stylists and designers are showing that 3D printing (and other techniques) can be used to create items that otherwise may never have appeared on the catwalk. The most recent example comes to us from Paris Fashion Week, which has just concluded The Dutch designer Iris van Herpen, in collaboration with MIT Media Lab and thanks to 3D printing technology by Stratasys and Materialise has stunned the public with two truly innovative models. 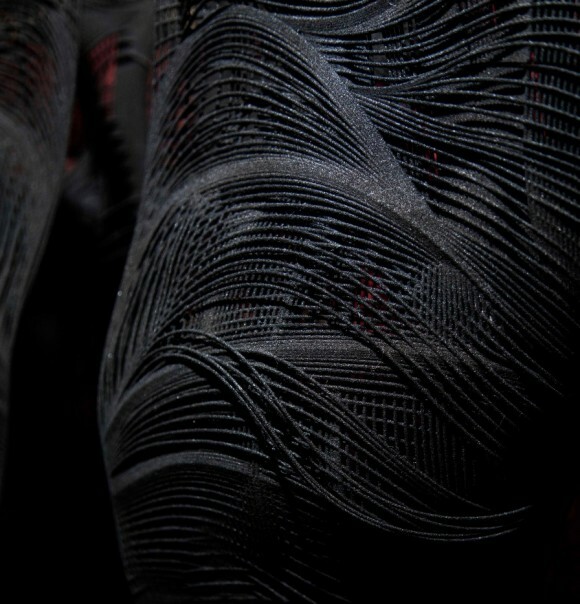 The Objet Connex by Stratasys permits printing multiple materials in a single object, making possible the combination of both flexible and rigid materials in the dress pictured below, which comes across as a kind of glamorous modern armour. Iris van Herpen pointed out that the inspiration behind this dress comes from another artistic-technological project that was made possible by 3D printing, again from Stratasys - the Imaginary Beings - Mythologies of the Not Yet collection that was curated by the architect and designer Neri Oxman from MIT Media Lab and exhibited in Spring 2012 at Paris's Centre Pompidou. This exhibit proposed the organic possibilities of 3D printing do the designer, who then took the concept to the next step of resolving the technology with moving, rather than static, forms. A second dress by van Herpen, presented at Fashion Week, shows a more delicate side of 3D printing, using machines by Materialise. Printed using laser sintering, it's intricate structure could not possibly be produced in any traditional manner (a bit like the hypercube, the classic example of what 3D printing can do, but much more fashion). 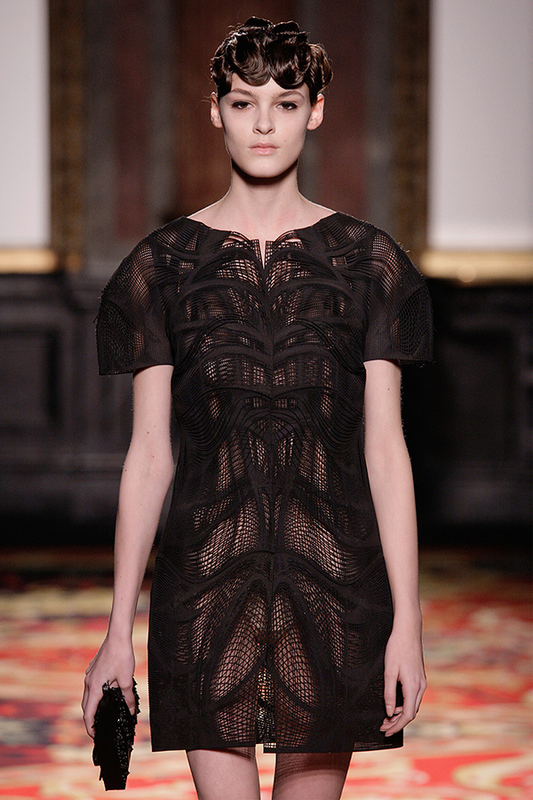 As van Herpen points out, there are no cuts or seams. Even the weave is high tech - made in collaboration with Austrian architect Julia Koerner, it is based on mathematically generated complex geometric structures. 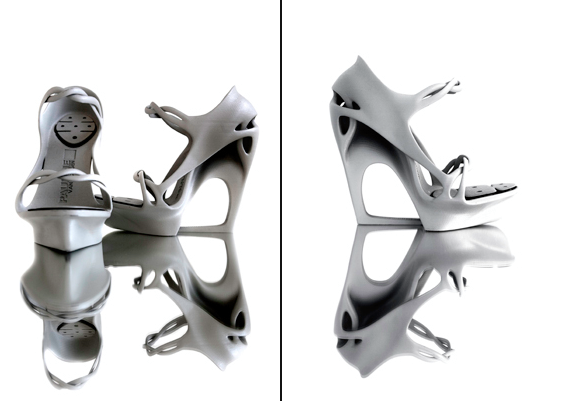 Before these pieces, 3D printing has already appeared in the fashion industry, though not as complex nor as inspired. The TechnoSensual show that was on in Vienna until September 2012 had the slogan "where fashion meets technology" and comprised creations of many types in which technology was united with clothing and accessories, with more or less success depending on the case. Lovers of 3D printing admired a not very recent but still innovative project: Morphogenesis by Pauline van Dongen, organic-inspired shoes with a structure that could really only come from additive manufacturing. The Dutch group Freedom of Creation had a role in this project - they produce all their design objects using 3D printing. Beyond this well defined sector of 3D printed fashion, there's the whole field of fashion creations that are based, in a more generic fashion, on tech components that are traditionally the tools of Makers: LED, small controllers, wireless modules etc. The limits here are really only creativity and taste, and with a little lateral thinking, some interesting products may be made. One example is Gravity of Light, a wearable technology project by Younghui Kim and Yejin Cho. What looks almost like a crocheted skull-cap is actually a 3D printed matrix in which each knot holds a LED. The cap's electronics measure the degree to which the head is inclined and turns on the LEDs located in that side. The result is that the lit up side of the hat seems to be always balanced, like the surface of water in a slanted cup. It all becomes clear in the video below. Gravity of Light from Younghui Kim on Vimeo. Whether made on large or small scale, it is clear that Makers' technologies are meeting up with fashion, and starting to go beyond being just for novelty. Projects like Gravity of Light are still probably the realm of wearable tech affictionados, where creations like Morphogenesis may have wider appeal. Works like those by Iris van Herpen, especially the dress made using the machine by Materialise, are 100% catwalk items, as wearable in the real world as anything else seen at Paris Fashion Week - and we're sure that come 2013, we'll be seeing much more of this type of innovation.